As noted, we are departing Maine a month earlier than usual in order to spend the holiday with our youngest two grandchildren and their parents. 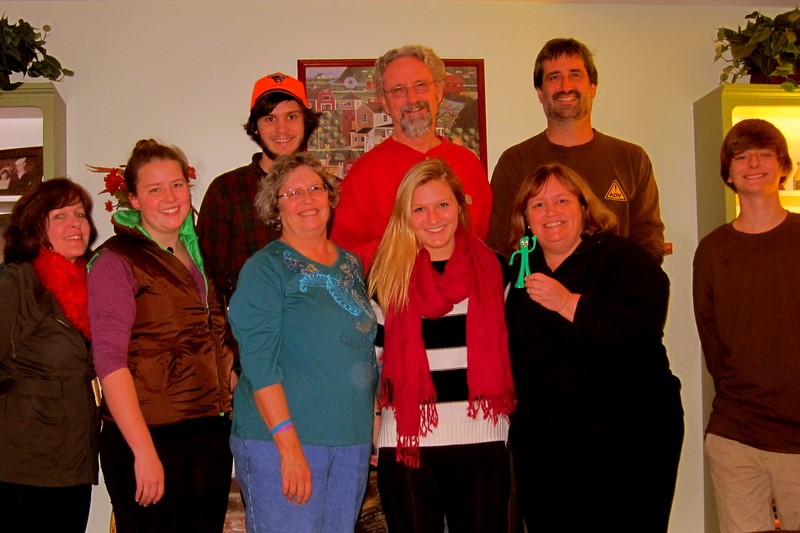 So, therefore, we celebrated our Maine Family Christmas on Thanksgiving, or as Kim called it, Thanksmas. The entire Maine (main?) Family gathered at our home for the Thanksgiving holiday meal as well as exchanging of gifts and the traditional airing of grievances and feats of strength. Above you will see (Left to Right) Ann, Abby, Joe B, Kit, Bill, Katie, Kim, Joe T, and Chris. You may notice that Kim is holding Gumby which represents the West coast members of the family who are (Right to Left) Jack, Tucker, Suzie and Kevin……yep, youse guys were there in spirit! A rousing good time was had by all; well except for Gumby, he had a bit too much Holiday Cheer and spent the entire next day sleeping it off under the Christmas tree. Thursday, December 12, 2013: We woke to the bright Texas sun streaming through the windows and temperatures in the mid-twenties…..yikes, could have stayed home for these kinda temps! After breakfast in the camper we departed Columbus RV Park at 0810 and continued west on I-10. Two hours later we crossed Woman Hollering Creek and jumped on the 1604 Loop around the north side of San Antonio. Now normally, at this point, we would turn north toward Austin in order to visit and door yard surf with Kit’s sister and her husband up in Kyle, Texas. However, over the past year they have purchased a summer home in San Diego, California and are currently there getting settled. Since our rough plan is to eventually hit the west coast and bounce about Southern California I’m sure our paths will cross at some point. The area west of San Antonio, the beautiful Texas Hill Country continues with its rolling terrain. But soon this gives way to flat, barren and boring. For the next seven hours we viewed desolation out the windshield broken only by the occasional stops for fuel, food or rest. Heading west on these annual trips always takes longer and seems more arduous. Until recently, I couldn’t figure out why. Then it dawned on me that there is actually a valid scientific reason that heading west across country is harder than heading east. You see, our planet rotates on its axis from west to east, or counterclockwise…..so therefore one traveling by motorcar from east to west is heading against the earths rotational direction. As an analogy, and so you lay folks can prove my scientific discovery, try this empirical experiment next time you’re at the Gym. Step on the treadmill as normal…..see how hard it is to walk up the length of the track. Now step on the treadmill facing the opposite direction…..your relative progress accelerates considerably and your life is a whole lot easier. Well, until you slam into that muscle bound dude bench pressing 300 pounds that is…..then it suddenly gets a whole lot harder. Feel free to share my discovery with any Planetary Scientist you may know. OK, back to reality. This area of the country is so devoid of life, I couldn’t even pick up NPR on the radio…..oh well, at least I had Kit to provide some sparkling conversation and make the miles glide by. Oh well, at least I could be lost in my thoughts for hour after hour after hour after………… We generally prefer to take US-90 across Texas because even though the progress is slower there is the sporadic cow-town that provides some interesting sights and the occasional comic relief. However, due to this year’s “Speed Run” mentality we stick to the Interstate…..and please don’t tell Maine DMV, they might take our BACK RD license plate away from us. 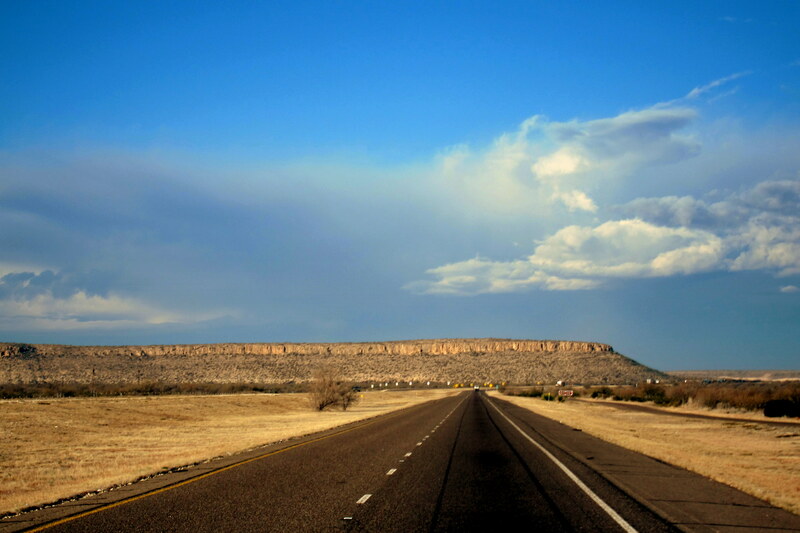 At 1705, tired hungry and covered with trail dust (the truck and trailer, not us) we pulled into the Fort Stockton, Texas RV Park for the night. A very pleasant surprise awaited us as this campground, pretty much in the middle of nowhere, featured a small café that served some fine home cooked meals. Tired of our own cooking we both enjoyed Texas Mesquite Barbeque Pork Ribs, hand mashed potatoes, fresh green beans, a drink and dessert….all for $7.95! What a bargain, and very good as well…..this place is now marked for a return visit! Still tired but with full bellies we called it a night. Friday, December 13, 2013: Up to threatening skies and temperatures in the mid 30’s, we were back on I-10 by 0800 rolling west. A prairie storm was brewing to the south but we skirted the worst of it however we did have to deal with short period of heavy rain. 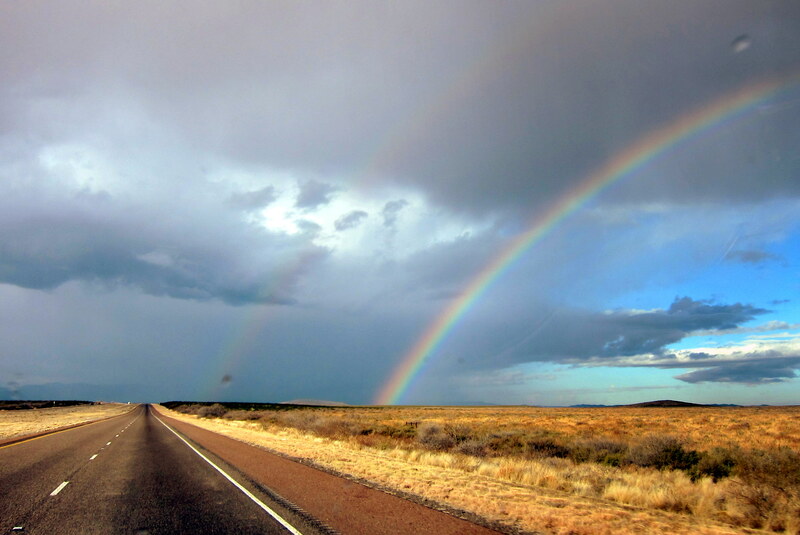 As the sky cleared, this incredible double rainbow graced our path. The rainbow stretched from horizon to horizon and was very bright. Within minutes it vanished…..hope natures morning display is a harbinger of great things to come. Within a few hours we merged with I-20 which is the route we would have likely taken had it not been for Winter Storm Cleon and a short while later we crossed into the Mountain Time Zone, banking another hour. 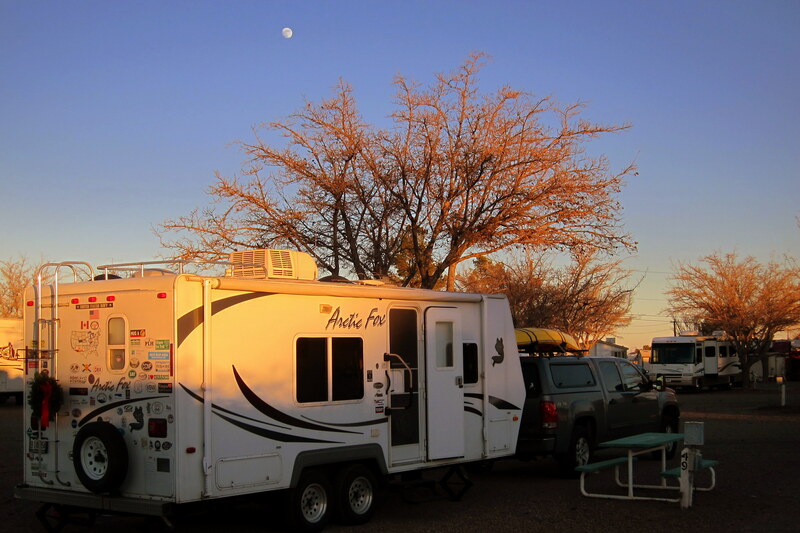 At one of the many rest stops folks our age tend to take on motor trips, I called Fort Bliss in El Paso to inquire about staying a few days at their very nice and convenient RV Park. Well, fitting the season, there was “no room at the inn”. This is a first for us in over five years and a bit of a disappointment as we needed some down time. Apparently the active duty soldiers who are temporally assigned here for training and receiving Per Diem have discovered they can buy an RV, economically stay at the park, and when returning to their home base have the RV paid for…..pretty slick if you ask me! Military RV parks are constructed for the men and women on active duty and if there is space available, offered to the military retiree. So no one should complain about being locked out of a military RV Park because the men and women that help protect our great country are utilizing one of their quickly eroding benefits. Time for Plan “B”…..since we needed groceries anyway we pulled into a local Wal*Mart. As Kit shopped I walked the parking lot to ascertain the feasibility of staying the night right here. Being very close to Juarez, Mexico about 30% of the vehicles sported license plates from the state of Chihuahua, Mexico. Another third of the cars, and their occupants, looked a bit sketchy. It also appeared the parking lot wouldn’t be very well lit so I deep-sixed that idea. While researching a convenient and safe place to stay I came across an iPad App that I downloaded to my Etch-a-Sketch…..it is produced by ALLSTAYS and is called Camp and RV. It has been honored with a 5 star rating, a rarity in the App World, and is the most comprehensive application for the mobile RV’r that I have seen to date. 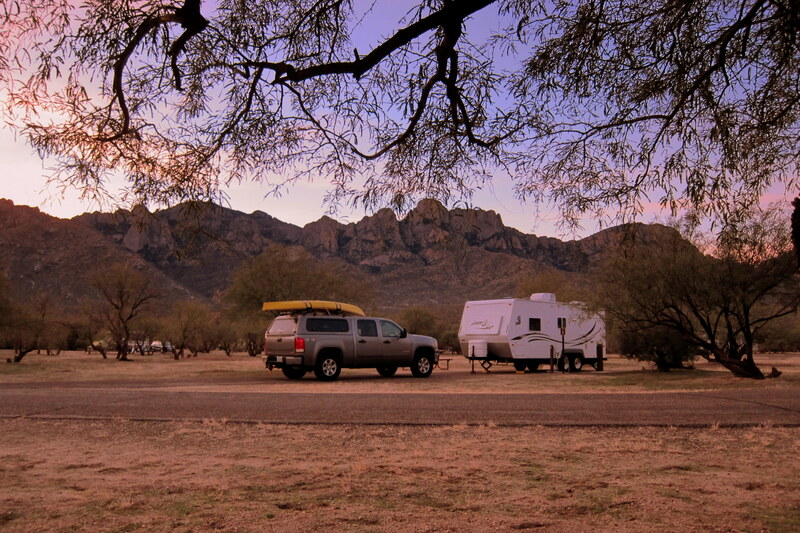 In addition to all the possible places to stay overnight such as RV Parks, commercial campgrounds, municipal campgrounds, casinos that allow camping, state and national parks, business parking lots, truck stops, rest areas or just safe wide spots in the road, it also lists many of the necessary RV friendly business and services. Most listings feature links to the facilities website, a contact phone number, the current weather in that location and reviews, ratings and comments provided by fellow travelers that have come before us. At a purchase price of $9.99 I believe this App is well worth the money. 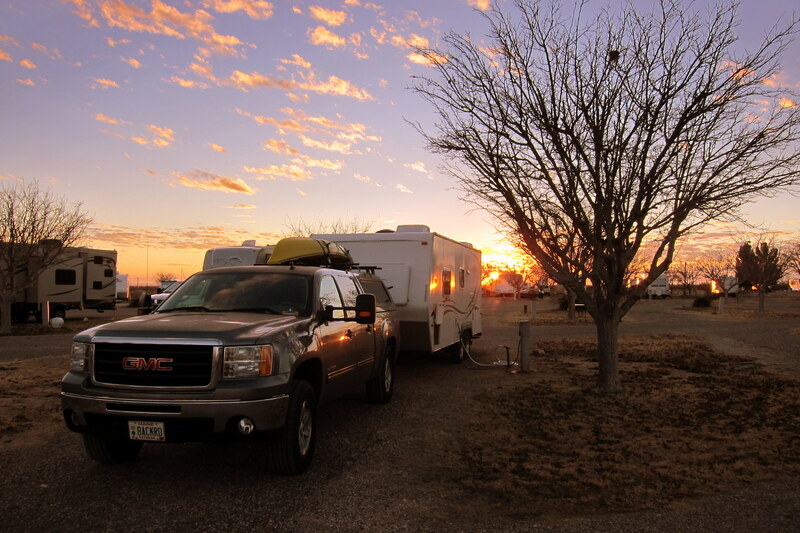 So, using ALLSTAYS, Kit was able to pick a nice clean campground across the New Mexico border in Deming, where we headed and came to roost for the evening. Saturday, December 13, 2013: Little Vineyard RV Park, Deming, New Mexico: Decided to take a down day as we are getting a bit road weary and needed to do some laundry. This park is very nice and has more facilities than most. In addition to the usual store, bathhouses and laundry, there was a very nice meeting room complete with kitchen and an indoor heated swimming pool with hot tub! The camping fee was very reasonable and the owners were as nice as can be. This park seems to be a favorite of northwest snowbirds…..there is one lady who has been coming here for over thirty years. While Kit did laundry I worked on the Journal. Then she wanted some quiet time to complete the Christmas cards so I took a walk into town. Deming was at one time a nice western town that frankly has seen better days. It is sad to see as we stayed here forty-eight years ago on a cross country transfer from San Diego to Key West, Florida and have fond memories of this once quaint southwestern town. Sunday, December 15, 2013: Woke to freezing temperatures and sunny skies…..won’t take long to warm up today! Fortunately I had checked weather.com and learned of the overnight lows so disconnected and drained the water hose. Other campers were not as fortunate as I noticed a number of folks staring at their frozen water faucet and scratching their heads. On the road at 0845 we are anxiously looking forward to our next stop, Tucson, Arizona and a long anticipated reunion with my mom and our Arizona family. After a few rest and fuel stops we rolled across the Arizona state line at 1048 and three hours later arrived at our home for the next few days…..Catalina State Park. 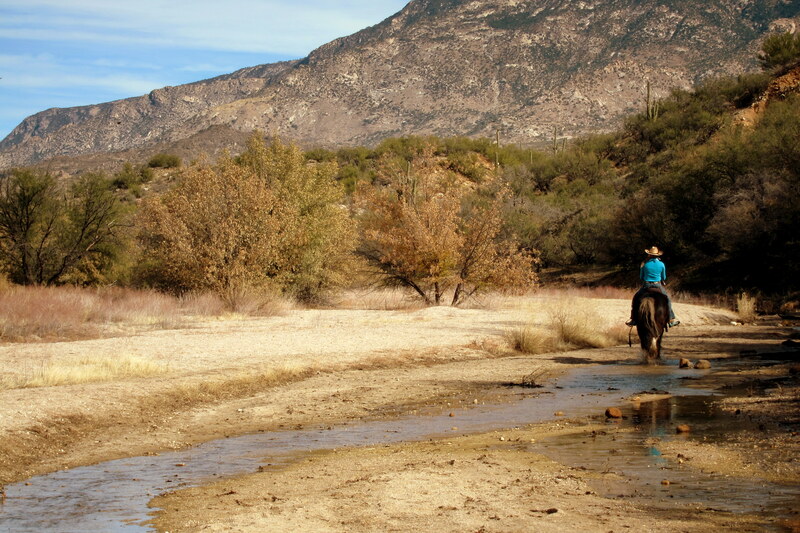 This jewel of the Arizona State Park system is located in the Oro Valley just north of Tucson. In all previous trips we have camped in the dooryard of my bruzin Dewey and his fiancée Bea. However, since this is to be a relatively quick visit, and since we have always wanted to stay in this park, and since Dewey and Bea were having their front yard and driveway totally redone this decision was a win-win for everyone. Decoupling truck and trailer and hooking up all shore services we made a beeline for Crossroads Adult Care Home to surprise my mom. 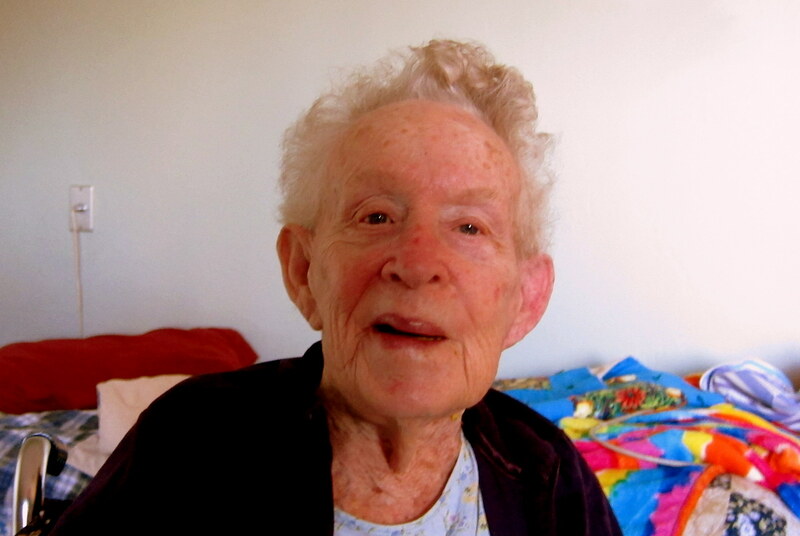 At 89, and after many strokes, she is doing OK…..doesn’t talk much but for the most part appears to be fairly alert. We surprised her with some Christmas gifts including her favorite See’s Chocolates and a warm fuzzy blanket. We plan to visit with her daily while in town. 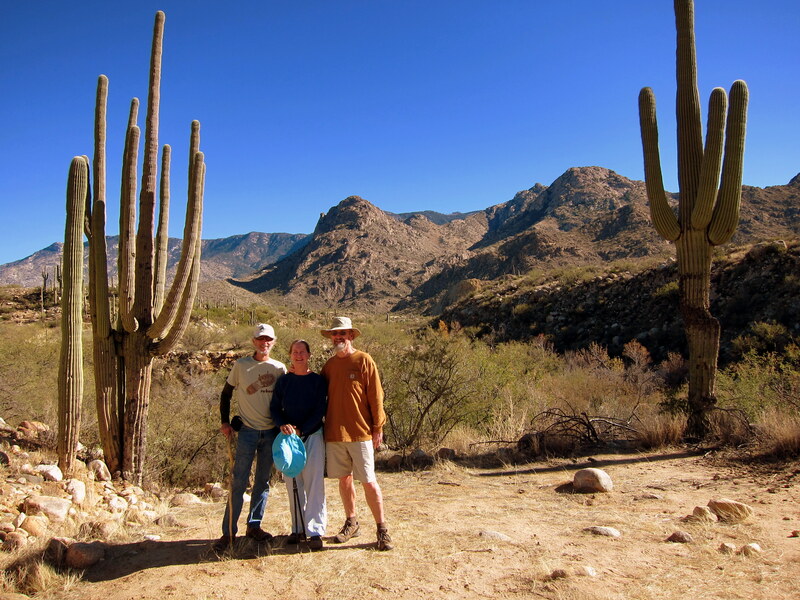 Monday, December 16 through Wednesday, December 18, 2013-Tucson, Arizona: We always have a great time in our winter hometown and this brief visit has been no exception. 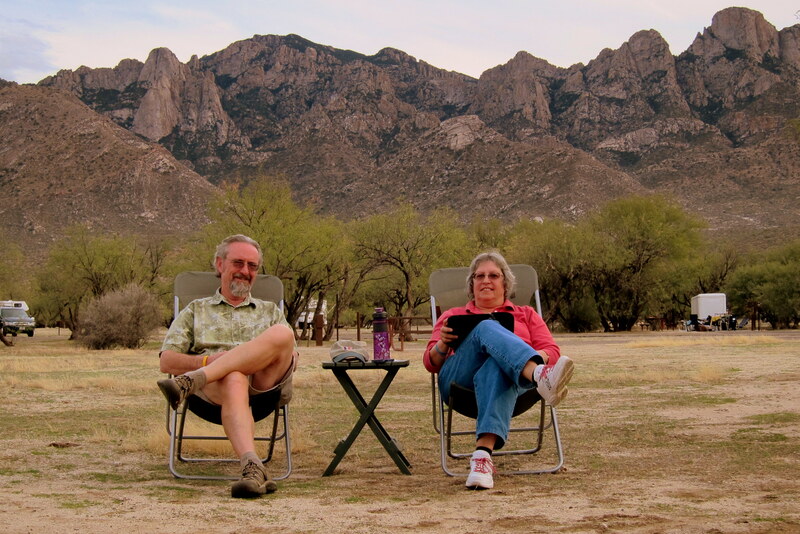 In addition to seeing mom and getting caught up with Dewey, Bea and Danny we took some time to recreate which was not hard to do as our campsite was situated in one of the premier facilities in the entire Arizona State Park system, which I believe is one of the best in the US. 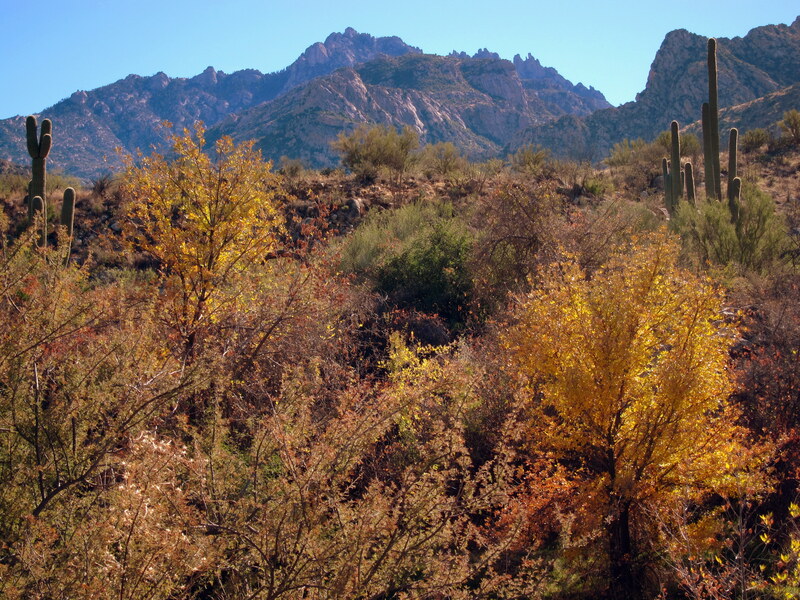 Catalina State Park is nestled in the western foothills of the Santa Catalina Mountains located in the Coronado National Forest. This mountain range is crowned by Mount Lemmon which at 9,157 feet is its highest peak and which averages 180 feet of snow a year…..yep, in the arid southwest! Our campsite had a perfect view of the Catalina’s and it was a joy to watch the sun rise over these majestic mountains each morning…..well, one of us got to enjoy the spectacle. On one morning I took my bike out for the first ride of this trip. 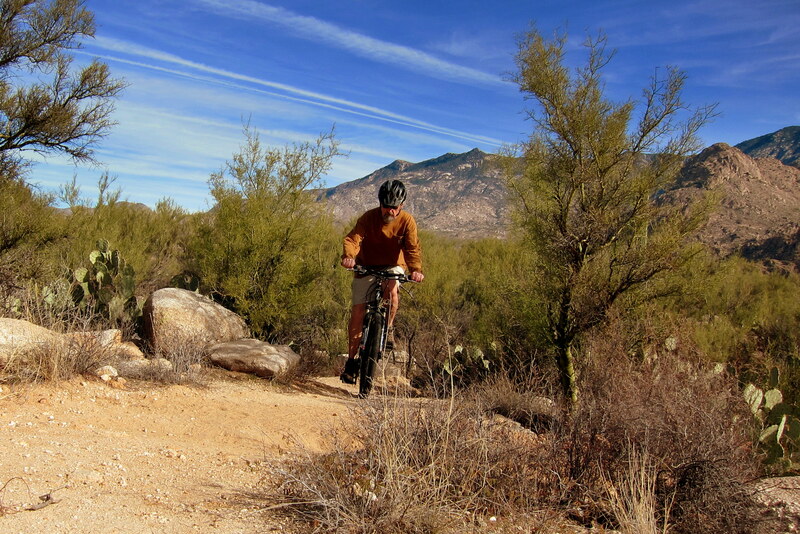 The state park is honeycombed with a variety of multi-use trails open to equestrians, hikers and mountain bikers. 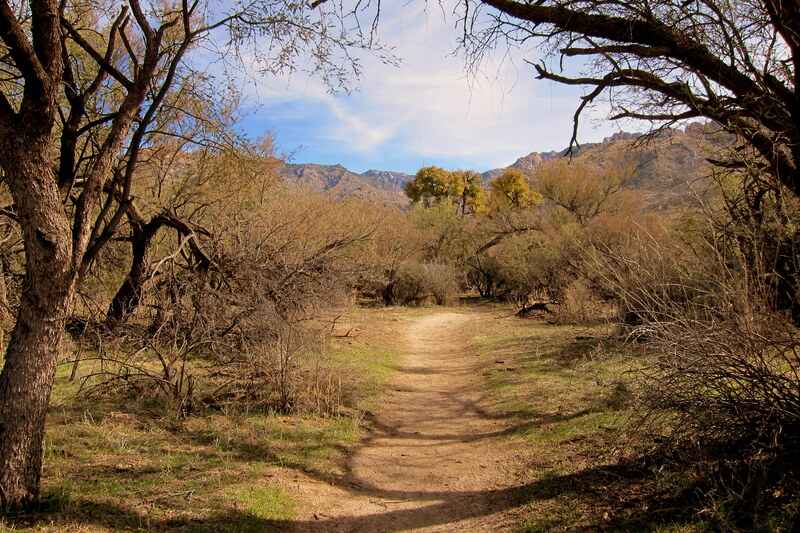 A lot of the trails are double-track which weave in and out of the desert landscape. However there are a few technical sections of single-track that takes more skill and youthful stamina than I possess (read-I walked them). I was out for three hours, logged 6.1 miles on the old GPS Tracks App, and only fell once…..fortunately not into a bed (funny word to use when pain would ensue) of cactus. Being a multi-use trail, I did come across a number of hikers and unlike some areas they were for the most part friendly. I always slow and move off the trail as the IMBA courtesy rules ask…..however there is always that 10% that believe their trails belong to them alone, I just offer a cheery good morning and pedal along. I also came across a number of souvenir piles left by our equestrian brethren. Since I’m usually not riding that fast I was able to avoid some rather nasty (pun intended) surprises since my bike has no fenders. I only came across one actual horseman however, and she was traveling down the wash as I was crossing it. Notice anything missing in her western regalia? Yep there is no industrial sized blue bag affixed to her saddle horn…..hey, if responsible dog owners have to pick up after their animals, why not equestrians?! The next morning Dewey, Bea and Danny joined us at our campsite. While Kit and Dan relaxed, visited and did their electronic gadget thing the rest of us set off on a hike into the foothills. There wasn’t much elevation gain or loss but we enjoyed a nice six mile hike through some very beautiful and rugged backcountry. The trail crossed a creek a number of times and since the temperatures were approaching the 80’s and the stream was fed from the surrounding mountain snowmelt, it was very refreshing to splash some cool clear water on your neck and face. Once again, we encountered many fellow hikers but only one equestrian…..although, once again we did step (pun intended) into evidence that they had passed this way before. I particularly like this photo. It could be a poster of a great metaphor of life. Great hike, and a really nice rest of the day as Danny, a chef at a local resort, treated us to his famous grilled shrimp which we all enjoyed back at Dewey and Bea’s place. Afterwards we looked at old family photos and told old family stories…..some of them for the tenth or eleventh time. Kit and I have had a busy couple of days, but we did take time to sit about and relax. 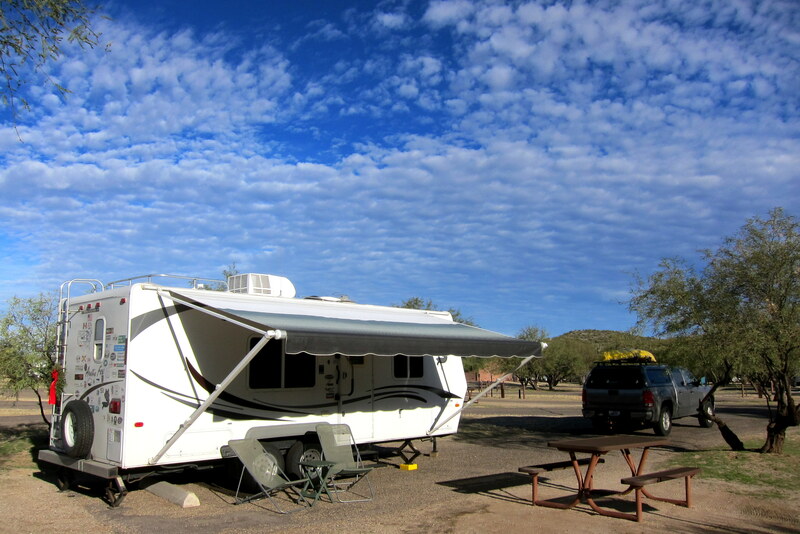 With daytime temperatures near 80 degrees, our campsite was bathed in glorious sunshine and the white puffy clouds that occasionally rolled in from the west just added to the sense of peacefulness. A truly great place to camp, relax and play! On one of my frequent walks about, I met an interesting fellow camped across the park. 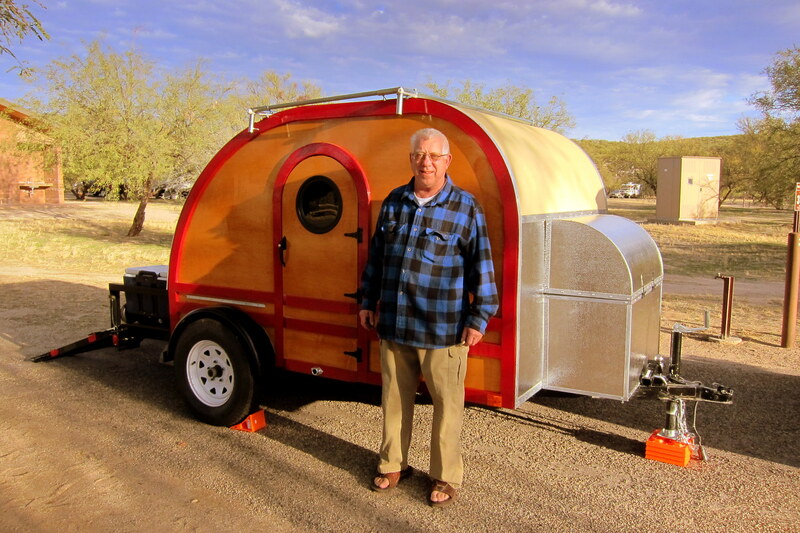 David is my age, a retired cabinetmaker and has a small retirement business making old fashioned “teardrop” trailers. His advertising consists of going camping…..in the two days he was here he showed his product to at least a dozen folks and received one order. Not bad I’d say! 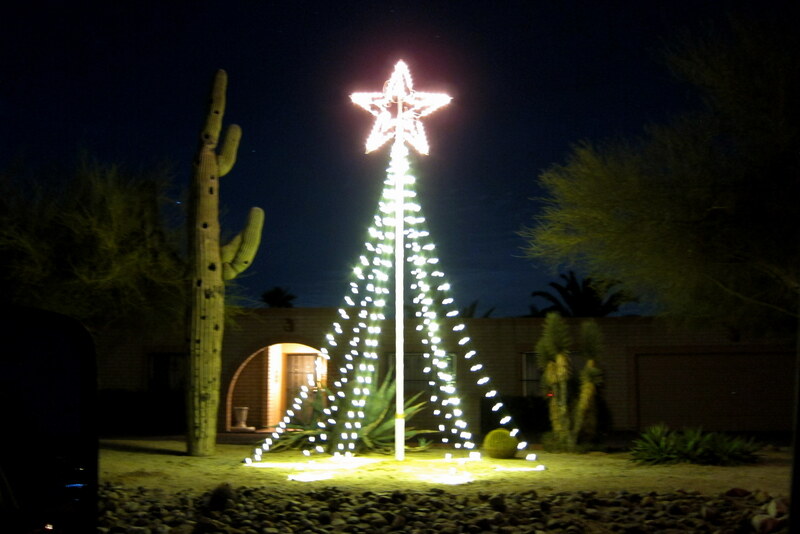 And just to let everyone know that some of the lesser appreciated holiday celebrations are thriving in Arizona…..below is a grand lighted display near Dewey and Bea’s home that celebrates Festivus! Frank Costanza would be very pleased indeed! 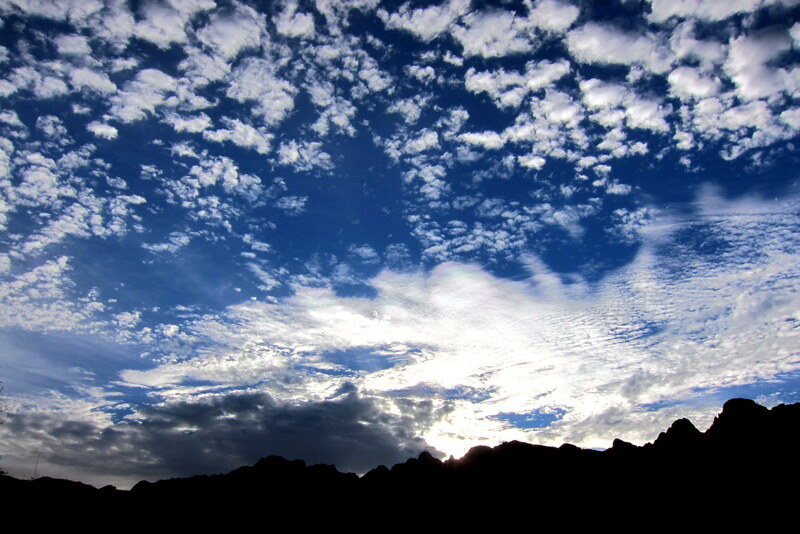 The beginning and the end of the day in the desert southwest can be spectacular. 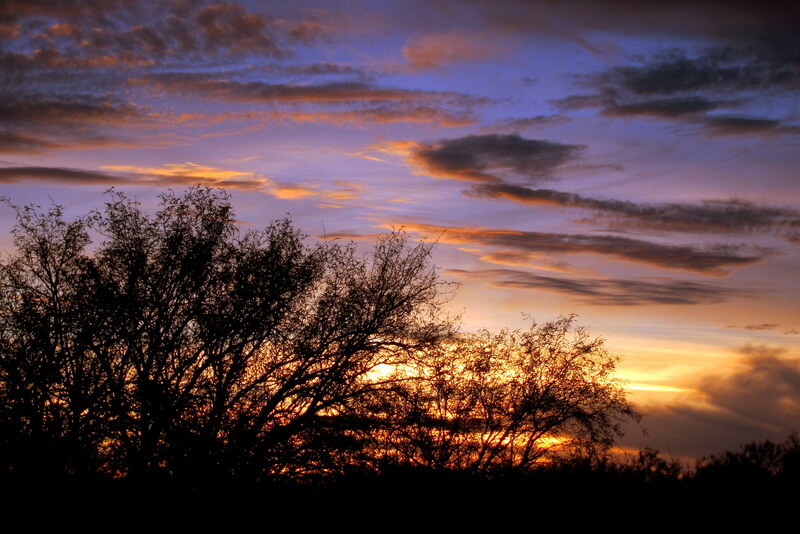 I’m not sure what I like better, the desert sunrises…. 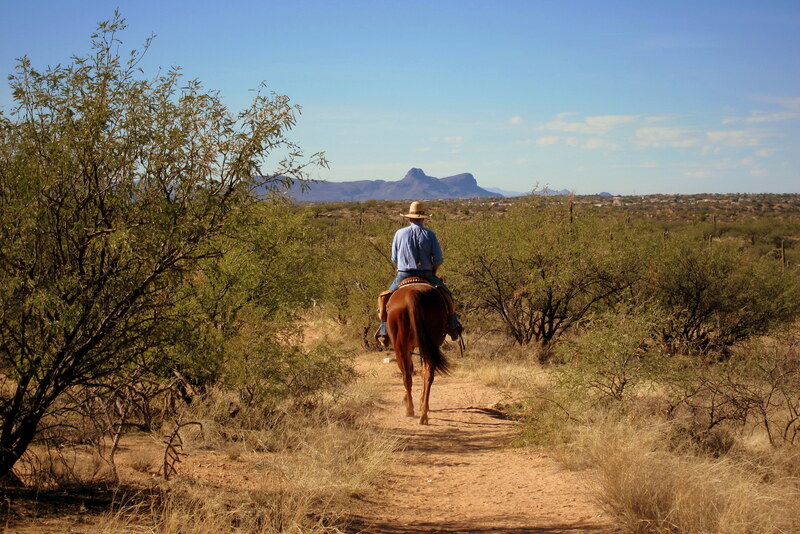 Actually, I think I like them both as well as all the hours in-between…..just love spending winter in the southwest! 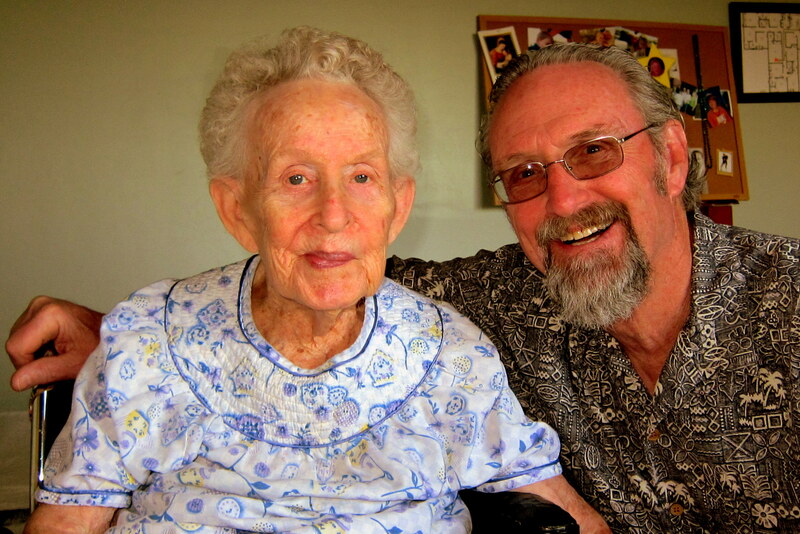 Fortunately, we were able to spend a portion of each day with my mom at her very nice adult care home. For the most part she is holding her own and seems to perk right up when we stop by. 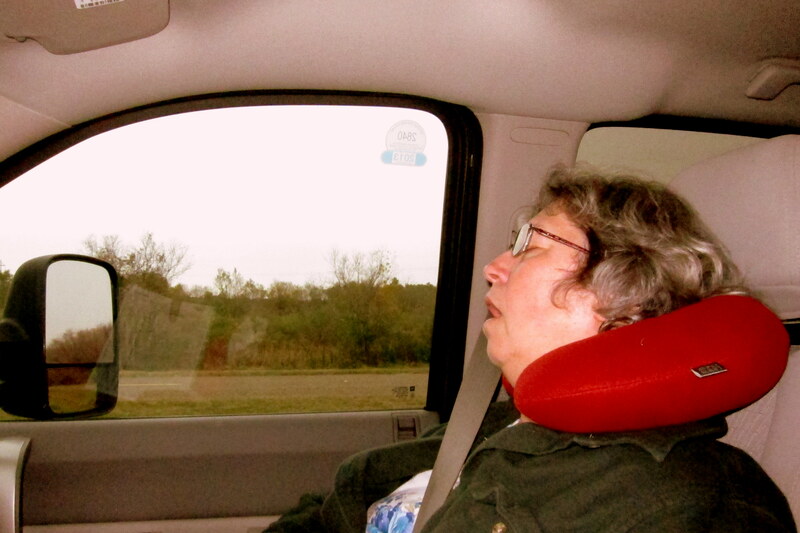 She doesn’t talk much, which must be hard on her because mom was the most outgoing and social person I knew. However her infectious smile and the twinkle in her eye, is still evident. Love you mom…..see you again real soon! 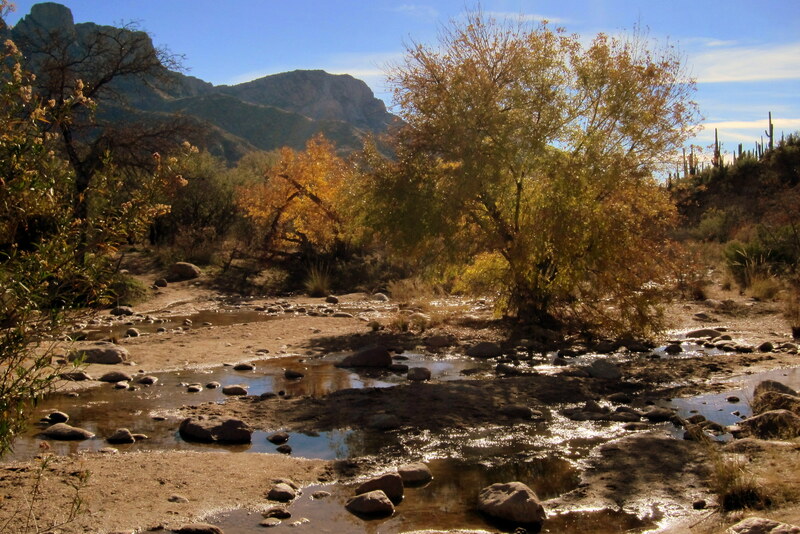 Great stay in the Tucson area, but tomorrow we head north toward Las Vegas and our youngest grandchildren…..stay tuned. Kit’s Corner: It’s always great to see Miriam, and the rest of our Arizona family. We enjoyed staying at Catalina State Park this time through, we had always wondered about how it would work for us… Oro Valley continues to be developed with new homes, schools and shopping areas, so having this beautiful state park right in the middle of it is a true gem in the Tucson area. Your trip just keeps getting better, as does my enjoyment in reading about it. Thanks for the comment and nice words. Stay warm and safe…..Merry Christmas to you both! I HAD TYPED A COMMENT AND THINK IT WAS DELETED. WE COULD USE SOME HORSE BUN PICKER UPPERS HERE IN EAST BOWDOINHAM. SOME TOWN FOLKS TRAILER THEIR RIDING HORSES DOWN HERE FOR EXERCISE. I BELIEVE THAT THE HORSES RETAIN ALL OF THEIR EXCREMENT UNTIL THEY REACH THE LITTLE GREEN BRIDGE NEAR OUR DRIVE WAY. THESE FRESH BUNS ARE QUITE PUNGENT AND WHEN FRESH, SPASH ON TO THE TRUCKS WHEELS AND RUNNING BOARDS. LAWS ARE ON THE HORSES SIDE, THEY HAVE THE RIGHT AWAY AND CAN CRAP ALL THE WANT TO WHERE EVER THEY CARE TO. ROUGH ICE STORM ALL OVER THE STATE LAST NIGHT AND TODAY. WE WENT OVER TO WINDY AND NANCY’S FOR DIN DIN YESTERDAY AFTERNOON AS THE ROADS WERE TO GET REAL BAD LAST NIGHT. THERE WERE 10K WITH OUT POWER IN THE BANGOR AREA EARLY THIS MORNING, I SUSPECT THAT WILL INCREASE ALL OVER THE STATE DURING THE DAY. LUCKY ME, I’LL BE DUCK HUNTING IN SNOW DOWN IN MASSACHUSETTS THE 26TH 27TH AND 28TH. STAY SAFE ANND KEEP US POSTED. Traveling against the Earth’s rotation is slowing you down? Wow. You may have outdone yourself with that one, Pop! Yea…..Arnt you glad your ol men’s is so smat? Thanks folks. We had a very nice Christmas….hope you had a great one as well. Heading to the coast in a few weeks then intend to bounce about Southern California and Arizona till mid March or so…..never know when we may roll through Yuma however we will be sure to contact you guys. Have a Happy Near Year! Bill and Kathy, As always the pictures and stories are great! I hope you both have a wonderful Christmas and a Very Happy New Year!! Thanks Nancy for the nice comment and Christmas wishes…..hope you had a very nice one as well! Enjoyed another edition of your journal. We have spent time at Little Vineyard 2 different times and also left our motorhome there when we went to Albuquerque to visit my Boston roommate and her husband. It is a nice campground. Also at the mention of Mount Lemmon I remembered that looking at it was what gave her her “snow fix” when she was living in Tucson. And speaking of Sandy, she and Marie arrived yesterday and this morning Marie took a riding lesson on one of the Lippizanner Stallions. Miriam is looking good. Enjoy Jack, Tucker, & ‘rents. Thanks folks for the neat personal recollections on the places we visit….. It’s always interesting to get other perspectives. We had a great Christmas with the kids as I’m sure you all had with Sandy and Marie. Stay safe and in touch…..miss you guys! One more blog down and how many more to go. Betty & I are in Virginia with the Grandkids until Saturday when we head back to Florida. David Jr. and Laurie are driving down also and as I write are about 1 hour away. Had to delay 1 day getting out of Brunswick because of the weather, but will be here shortly. Love the pictures, and of course Kits Corner. Your blog Bill is of course always well done. Thanks folks, for the nice comment on the journal. We had a very nice Christmas in Las Vegas as I’m sure you all had in Virginia. Plan on sticking around for another few weeks then head to the coast, then….???? Stay safe, miss you guys! On the Road Again with the Tuckers. Gee folks your missing a lot of winter wonderland back in Maine!! Merry Christmas to all of you and your family. Our family is doing much better. Tommy is moving and transferring beautifully from bed to walker or wheelchair. Dad is just chugging along. Gloria and Rod were here for a few days and we had a good time with family. That means a lot. Love to all of you and if your in Phoenix, let us know. Thanks Marti, hope you all had a Merry Christmas as we did here in Las Vegas. Glad Tommy and your father are both doing well and that you all had some family time together this season. We plan on heading to the coast from here in a few weeks then bounce around the southwest till mid March we return to Tucson…..our desire is to spend a few days in Sun City during this time and visit with you folks. Heard from your brother and Gloria, sounds like they are ready for the life of the retiree! Take care, looking forward to seeing you all soon! !